Scavenger 6, the ultimate survival weapon. Imagine one gun that can shoot almost any bullet! It’s not who can carry the most amount of guns anymore… It’s who can find and shoot the last remaining bullets. 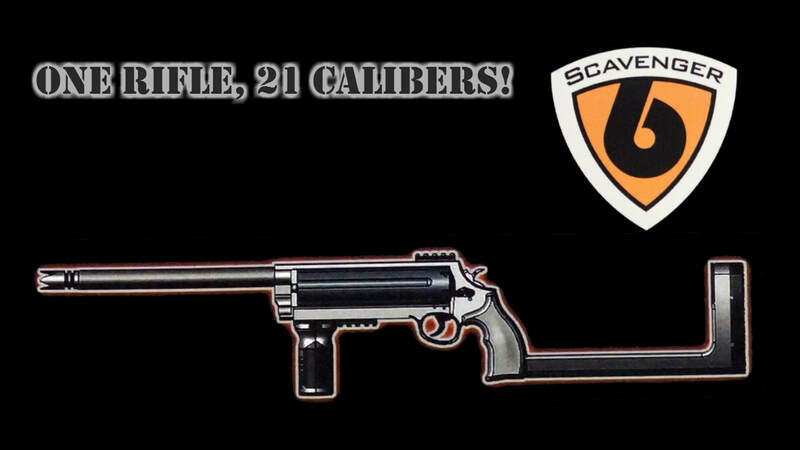 The Scavenger 6 can shoot from .22 caliber to .308 caliber bullets and everything in between. It’s lightweight design makes it much easier to carry than multiple guns. We designed an ultrafast cylinder barrel change over system so that you can shoot different caliber bullets in seconds! Can shoot from .22 caliber up to .308 caliber bullets and everything in between. Lightweight and easier to carry than multiple guns. At less than 5 lbs, it can be carried all day if necessary. Ultrafast Cylinder Barrel change over system. High-powered laser for accuracy in day and night. You only have to register one gun with the ability to shoot multiple bullets, saving you time and hassle. Store your gun in less space and replace all of your other guns with just one gun… the Scavenger 6. One gun that shoots any bullet – Bullets will be a hard item to find in a survival situation, this product allows you to adapt to whatever you scavenge, beg, barter, or steel. Interchangeable Cylinder Barrel’s (CB’s) allow you to switch from one caliber to another, keeping your muscle memory from one caliber to another. Easy to handle – Women and small children can shoot and handle it with confidence. Scavenger 6 shoots like a rifle – More accurate shots on target. Pistol grips and adjustable buttstock – Takes the kick out of the gun and easily adjusts to different body frames sizes. Light and laser fore grip – Allows you to see your target in low light with the strobe setting. It will also disorientate your attacker. The laser will scare most people from attacking & will help you shoot from the hip in low light situations. The picatinny rail – Allows you to easily mount any kind of optics, lasers or lights. Steel pig sticker at end of the gun – Allows you to stab and use the gun as a weapon even without ammo. The revolver design is a much more reliable platform than traditional semi-automatic weapons. World’s Number 1 Survival Expert & Inventor releases his greatest triumph.. The Scavenger 6 gun. After inventing the Timahawk, Crovel and X Caliber to name a few, Tim has taken survival to a whole new level, empowering the every day parent and civilian with the most versatile and practical gun in the world. Tim’s passion for protecting his family and being prepared for anything has fuelled one of the most genius inventions that will impact the world and how we stay safe and survive. “Tim Ralston is also a number 1 best selling Author in Amazon for his book “Minimalist Prepper – The Survival Essentials” and is consistently educating and inspiring families to be prepared for any survival situation.